This woollen touch throw is generously sized at 130cm x 170cm to fit over armchairs, sofas or bed ends. It can be used as a decorative throw or as an extra layer during colder winter evenings. Wonderfully soft and cosy. 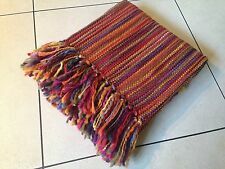 LARGE JOHN LEWIS HERRINGBONE DESIGN THROW WITH TASSELS. LIGHT& DARK GREY. This is a throw by Jonelle(John Lewis). I removed the label as it was sticking out in use but that's where it was bought. It's washable and can be tumble dried. Vintage Hand Made Beautiful Floral Print Blanket Was never used, just made to give as a gift. Size 69 x 51 including the tassels. This beautiful olive green and cream lines throw/blanket is ideal. Useful for picnics, your car, bed or sofa. 130 x 150 cm. New listingHandmade Hand Crochet Blanket Shell Stitch Chunky Multi Coloured 47 x 45"
47 x 45" 114 x 119cm. Very well made and perfect clean condition. Our gorgeous Harbour Blanket is perfect for draping over a bed, sofa or armchair. A harbour grey back drop with a subtle dark grey check and contrasting fringe creates a modern style. Reminiscent of traditional Irish woollen throws this beautiful throw is generously sized at 130cm x 170cm. This luxuriously soft throw is perfectly sized at 130cm x 150cm to fit over armchairs, sofas or bed ends. It can be used as a decorative throw or as an extra layer during colder winter evenings. Wonderfully heavy weight and soft. Dark Blue/purple and grey soft throw. Do not tumble dry. the throw is soft and light weight. the bed shown in the picture is a super king. can be washed at 30c and ironed on a cool setting. STYLE: LYLA THROW. SUPER SOFT TWEED SWEATER LIKE THROW. SOUTHERN LIVING. 71% NYLON, 29% ACRYLIC. SIZE: 50" X 70" (127cm x 177cm). MACHINE WASHABLE. Beautiful stripe acrylic throw, perfect for adding a splash of colour to your room on winter nights. Size:127 x 152 cm (50" x 60") | Colour:Grey. 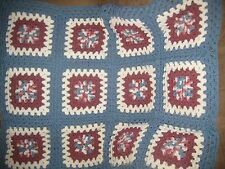 HANDMADE EXPERTLY CROCHETED AFGAN THROW. Yellow with accents of Blues, and Greens. It is a nice 46" x 48". Made with Red Heart Yarn. 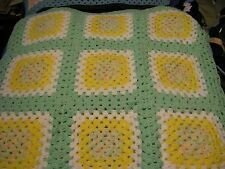 This throw/blanket is hand made by crochet. It is in beautiful colours including various shades of pink, blue, green, lilac and purple. It's a vintage style but very retro! Beautiful for a bedroom or lounge. 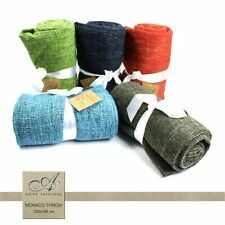 The throw/blanket is crocheted in acrylic yarns in assortment colours, it's a great weight and wonderfully warm and soft. Measurements are 185cm by 150cm Cool wash recommended. New Hand Crochet Light/Robin's Egg Blue Granny Square Blanket. Scallop edge around entire afghan. 52" x 68" Afghan- large! use for Throw or Bed Cover. Perfect for a Twin Bed or Guest or Boy's/Guest Room or Back of a Couch. NEW HAND CROCHET MULTI-FALL COLORED CHEVRON STRIPE AFGHAN APPROX. 32" X 64"
This is just one of many handcrafted crochet afghans I've made over the years. Is is pictured draped across the foot of a queen sized bed. They wash up beautifully, get softer with each wash and never fade or wear out. Multi color with white fringe. Very durable machine washable in cold water and dry cool. Made in 2012. 90% acrylic 10% polyester. VINTAGE Large Handmade Round White & Lilac Blanket Throw Diameter 65"
White & Lilac. Blanket Throw. Large Handmade. Hexagonal Round. For sale are49 granny squares for( self assembly ). All ends will be woven in before dispatch leaving just the sewing thread. Either make a square or a rectangle or whatever your project. Country Club Modena Acrylic Throw Grey 130x170cm. Grey and white knitted style with simple check pattern. Made from 100% polyester. Machine washable. Great gift ideas. New Handmade teal, brown and tan crochet blanket. Made of all Red Heart Yarn. Each blanket is one of a kind. It is approximately 24" x 27". This blanket is perfect for a crib, for a stroller or as a decoration. My mom enjoys making these beautiful blankets and has many different colors already made! Check out my other auctions for more colors and sizes! Crate & Barrel Lindsey Throw Blanket Natural. Fringe on either end adds to its beautiful drape. Size: 40" X 70". New - RRP £50. Laura Ashley Lace Throw in Steel / Grey. Primark Harry Potter Slytherin Woven Blanket throw. BNWT 125 x 15 cms. Lovely woven throw, I currently only have these left in Slytherin. Crochet Afghan Shells in Soft White with Multi-Color Stripes 72" x 52" EUC.